Absolutely brilliant.My initial thoughts when I first discovered These Broken Stars was: That sounds similar to Under the never sky by Veronica Rossi: Dual POVs with two personalities that clashes, A female character who's accustomed to a life of luxury and privileges who discover a whole new world...And to be honest, that's exactly why I picked up that book. Under the never sky is one of my favorite books of all times and now that I've read the last book in the series, I wanted to discover something similar. And I got exactly what I wanted and more.This book far surpassed all me expectations. -Geogeous cover. And it's related to the story. -The twist and turns were unexpected and to be honest, that's the first book that made me feel like I was goind crazy. At some points, I didn't know what to believe and I have NO IDEA what was going on. 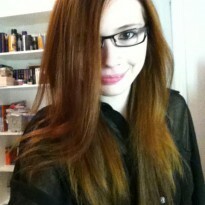 -She's just so much more than she appears to be. She's smart and interesting and as brave as Tarver. I love both characters as individuals and the romance and friendship between them only made me love them more. And the chemistry between them! Aghhhh. -I loved that there was no “insta-love. Immediate attraction? Yes! Love? Not at all. There was lots of build-up to the romance. -The brief bits of Tarver's interrogation preceding each chapter that added a lot of suspense to the plot. I needed to know what was going to happen next. 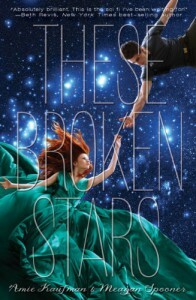 A little bit of Shades of earth by Beth Revis, Under the never sky by Veronica Rossi, Lost (tv show)and a little something special of its own=These Broken Stars . If you like a little creepy mystery, romance and survival stories, give this book a chance! It's impossible to put this book down!